The University of Seoul (UOS) Institute of International Cooperation and Education (IICE) hosted the Seoul International Summer School 2018 from June 26 to July 27. 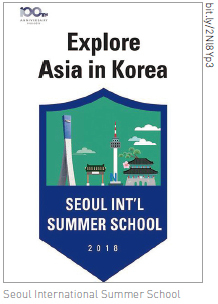 Seoul International Summer School was a program that offers opportunities for foreign students and professors to experience and learn about Korea and Korean culture with domestic participants. The lectures covered Korean politics, economics, culture, history and language. Furthermore, they could also experience various activities held in Seoul and other cities. For example, the participants participated in field trips conducted in Jeonju city and Jeju Island, toured the Demilitarized Zone (DMZ), and watched a Nanta performance. The purpose of this was to inform foreign participants of Korea, Seoul, and our university. About 100 students and professors from 46 universities of 26 countries participated in this program. For the smooth progression of the program, UOS IICE also recruited peer advocates, who consisted of UOS domestic students. Peer advocates stayed with the foreign participants at the dormitory, located inside the campus, studied with them and joined them for the activities during the summer school program. Students who took charge of peer advocates could gain some advantages like a chance to communicate with foreigners, free entry fee, 30 hours for volunteer work hours, and complimentary accommodation at the dormitory. One of officers in UOS IICE said that this program would be a good chance for enhancing nongovernmental diplomacy between domestic and foreign students. Also, they said that the program could contribute to the expansion of the international exchange between UOS and foreign colleges.